Since the end of 2015 until today, Kuta Beach Bali is always filled with garbage from the river around the beach. Garbage is always piled the beach. Every trash day definitely continue to look. This phenomenon continues to occur each year. Trash in Bali's Kuta Beach is a regular occurrence every muaim rain in Bali. Weather in Bali today is very bad for the rain and storm. Sometimes the rain is accompanied by a hurricane. Even last week at Gilimanuk occur tornado at Bali Strait were very surprised people in the port of Gilimanuk. Flooding in Denpasar impact negative impact on Bali's Kuta Beach. Flood carrying garbage from the gutter to the river. Garbage in the river hanyud rushing water swept away and large. Garbage into the sea, and then stranded in Bali's Kuta Beach. Every day, every hour, continuously until the beach was filled with garbage from the river. This year's holiday is probably the worst for foreign tourists who were in Bali. Piles of garbage on Kuta Beach Bali this year is very much. Per day of waste can reach 8 tons. Janitor so overwhelmed with this situation. 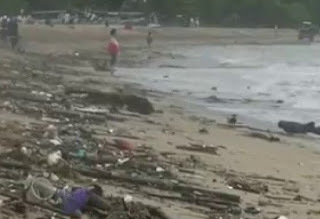 The government has tried to use his best effort, but the garbage continues to accumulate at Kuta Beach Bali. Janitor clean up the garbage in order to give a sense of comfort to the tourists who are on holiday in Bali. However it was difficult to realize. Kuta Beach Bali is dubbed as hell beaches in Bali. Since it is very dirty and full of trash. Even the garbage on Kuta Beach exceeded garbage in remote beaches in Bali. The beach is the gathering place of the garbage mountain, but in very poor condition Kuta and disgusting. Hard to imagine. If only a small garbage and a few, may be excused. But this rubbish is very much, a lot, exceeding the capacity of jumbo trucks. Terrible, the main goal of foreign tourists beach while on vacation to Bali. Disgusting, that's the first impression on foreign tourists felt at the sight of Kuta Beach are filled with garbage. Not only wood and leaf litter, as well as plastic and cans. Many tourists are disappointed when they will be sunbathing, or wish to surf. Attraction with trash. Vacation in Bali with trash is a terrible experience.